The acts of hatred aimed at the Jewish community this week were acts of hatred aimed at us all. The desecration of the Jewish cemetery in Philadelphia was an act of desecration all of our core values. The threats against JCCs across PA were threats against our common humanity. These acts of hatred are wrong, and they have no place in Pennsylvania, or in the United States. I am calling on the United States Department of Justice to investigate these cowardly actions for what they truly are – hate crimes against the Jewish community and everyone in Pennsylvania. And I have directed the Pennsylvania State Police and the Pennsylvania Department of Homeland Security to work hand in hand with our partners in local law enforcement to help find those responsible for these actions. The vandalism and bomb threats aimed at the Pennsylvania Jewish community these past few days are reprehensible, and will fail in their attempts to instill fear. 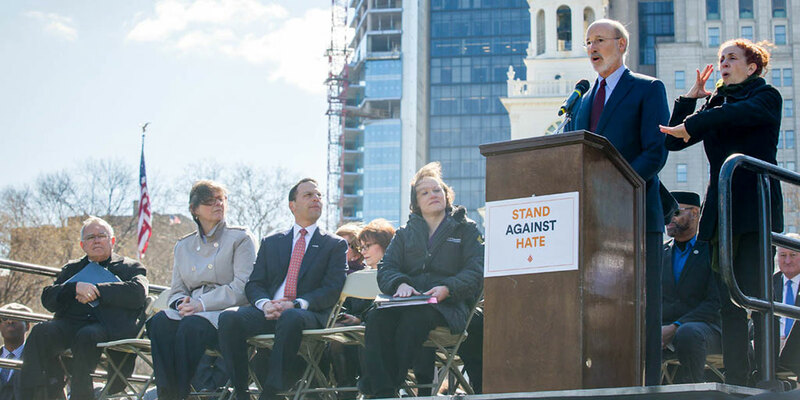 We are all here today to take a stand against these vile actions, and to say to those responsible that this kind of hatred and intimidation will not be tolerated in this Commonwealth. I am proud to see so many members of different faiths here to show that no one should be afraid, because as Pennsylvanians we stand together against acts like these. Pennsylvania is a place founded centuries ago on the idea that all are welcome, and can practice their faith and culture as they see fit. And we still live by that grand idea today, because ours is an open and welcoming state. We live by that idea not only because it is right to do so – it is – but also because its smart. We want to continue the rich tradition of openness and inclusiveness, so that when people are choosing where to go to school, where to begin their professional lives, where to start their business, or where to raise their family, they know that Pennsylvania is open to them. Actions like the ones we have seen recently present the opposite picture of Pennsylvania – and paint us as a place that is closed off and small minded. That is not what Pennsylvania is. Instead, PA is a Jewish day school hosting a Martin Luther King Day of Service to benefit their local community in Pittsburgh; it is the Jewish Federation of Philadelphia collecting food to donate to the hungry; it’s the Muslim community and labor leaders raising funds to rebuild the vandalized cemetery – it’s people reaching across lines of religious faith and cultural heritage to help one another – that is what Pennsylvania is. Pennsylvania is a place where we come together to accept and support each other. So these senseless acts are not what Pennsylvania is. Hatred has no place in this Commonwealth – any time – any where.